The bottom line is this – the Manufacturer Expected Page Yield is only valid when you print at 5% page coverage. If the amount of ink or toner being used per page increases the page coverage, the cartridge should yield fewer pages. If the amount of ink or toner covering the page decreases, the cartridge should yield more pages. How do you determine whether you are getting a “fair” expected page yield from your cartridge? Some printers will actually display to you the coverage that each cartridge is printing. In this example you can see that the Yellow toner cartridge is applying 3.9% coverage to each page, and in turn will supply you a higher page yield than what the manufacturer estimated. If your printer does not display the page coverage for you there is a simple way to determine what coverage you are printing at, and help you understand why your toner cartridge may be giving a page yield different than the Manufacturer Expected Page Yield. Please note that you must do these calculations before you remove the cartridge from your printer! Replacing the cartridge will cause all of the page counting statistics to be “reset” by the chip on your new cartridge. 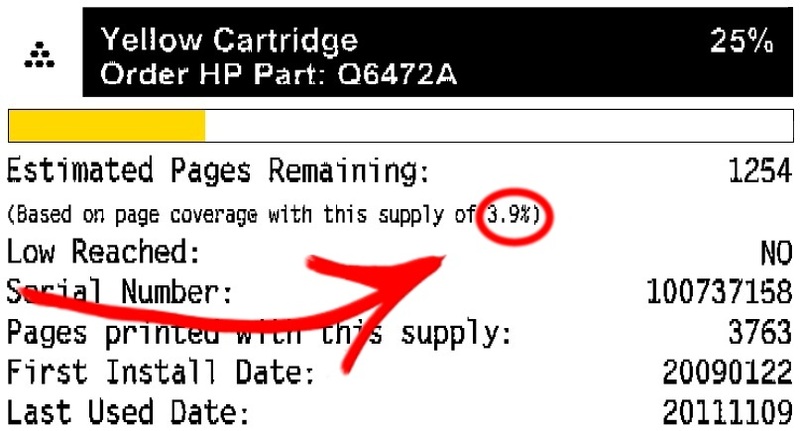 First, you will need to access cartridge statistics information from your printer (please see the example of the HP part Q7551X below this section). Typically you can access this information via your printer control panel, via the printer management software installed on your computer for your printer, or via the printer “properties” stored for your printer on your computer. Calculate the “Constant” by multiplying your Manufacturer Expected Page Yield x 5%. For our example below for the Q7551X the Manufacturer expected page yield is 13,000 pages. The Constant would be 13,000 x 5% = 650. Determine the “Adjusted” Page Yield by adding up the pages already printed with the expected pages remaining. For our example this would be 8771 + 1084 = 9855. Calculate the actual page coverage by taking the Constant and dividing it by the “Adjusted” page yield. For our example this would be 650 / 9855 = 6.5956% page coverage. 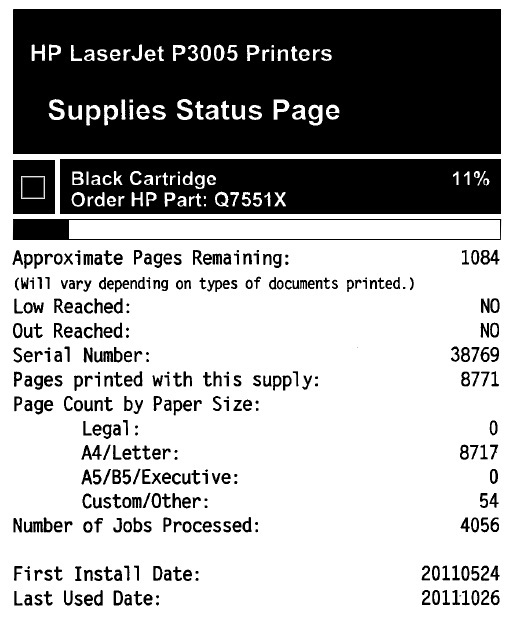 You can see in this example that the reason that this toner cartridge is only going to yield 9,855 pages instead of the estimated 13,000 pages is because the user is printing with a page coverage of 6.6% instead of the industry standard 5%.